NOOR Jehan, the melody queen who enchanted millions of music lovers in the subcontinent for more than half a century passed away four years ago in Karachi on December 23, 2000. Those who witnessed her meteoric rise from a child artist, Baby Noor Jehan, to Malika-e-Tarannum greatly miss the phenomenal musical genius. No other singing star of the sub-continent in the 20th century ever reached the commanding heights of name and fame achieved by Noor Jehan, the nightingale of Punjab. She brought a revolution in the world of popular music and even gave form and content to Punjabi folk songs. Born at Kasur in a family of professional musicians in 1926, she was named Allah Wasai. From early childhood, she showed unusual interest in music. After listening to any folk song, she would imitate it to perfection. Struck by her inborn talent, her mother arranged for her training in music along with her elder sister Eidan who was already learning dance and music. In those days, Calcutta, with its chain of theatres, drama companies and film studios, was a mecca of performing artists, script writers, lyricists, etc. A number of Punjabis in this field like Agha Hashr Kashmiri, Kidar Sharma K.L. Saigal, K.D. Mehra and others had gone to Calcutta in search of fame and fortune. So, in the mid-30s the family moved to Calcutta in the hope of finding an opening for the two sisters in local theatre companies. They soon got an opportunity to sing and dance on the stage. Impressed by Allah Wasai’s performance, Ghulam Haider who composed music for K.D. 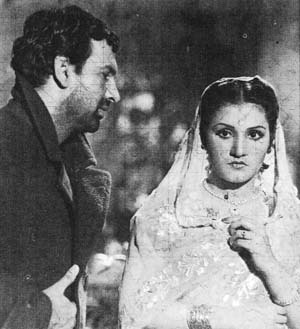 Mehras’ first Punjabi film Sheila alias Pind Di Kudhi, gave her a small role in her new incarnation as Baby Noor Jehan. The film released in 1935 was a roaring success all over the Punjab, and it also paved the way for the establishment of a Punjabi film industry. Her song lang aja patan chana de o yar became a hit. By the late 1930, a number of studios came to life in Lahore, led by Pancholi Art Pictures. The emerging demand for singers and actresses prompted the family to return to Lahore in 1937. As the story goes, Dalsukh. M. Pancholi, the leading producer who was scouting for talent, once heard Baby Noor Jehan sing. He was so much impressed that he gave her a role in his Punjabi film Gul Bakawali (1939) which was a box office hit. Baby Noor Jehan with her popular number Shala Jawanian Mane at once got recognition and fame. This was followed by Pancholi’s Yamla Jatt (1940) and Chowdhry (1941) with memorable Punjabi songs by her like Kachian wey kalian tu na tod and Busbus wey dholna ki terenal bolana. Ghulam Haidar who composed music for the films also became famous in the film world. It was he who groomed Baby Noor Jehan. In 1942, Noor Jehan dropped the affix of ‘Baby’ from her name when she appeared as heroine at the young age of 15 in Pancholis’ historic movie Khandan in Urdu. It was an instant hit and brought countrywide fame to Noor Jehan. This marked the beginning of her legendary career as a singing super-star of Indian cinema. Her melodious voice and remarkable talent as a singer greatly impressed the connoisseurs of music. I still remember her haunting numbers from Khandan, Tu kaun si badali mein mere chand hai and liye jahan mein which took the Bombay audience by storm and many offers from the film producers began pouring in. Noor Jehan moved to Bombay in 1943, and during a brief period of four years, she surpassed all her peers. The older generation on both sides of the border is still nostalgic about her classic movies viz. Lal Haveli, Dost, Zeenat, Bari Ma, Gaon Ki Gori and Mirza Sahiban. Her greatest hits of the period, however, were Anmol Ghari (1946) where she plays the leading role opposite Surender Nath, the famous singer actor and Jugnu (1947), where she co-starred with Dilip Kumar. Her unforgettable songs from these two films can be heard even now — Awaz de kahan hai, Jawan hai mohabbat Aaj ki raat, Saaz-e-Dil and the duet Zahan badla wafa ka with then the little known Mohad Rafi. Jugnu was still running to packed houses all over the country in 1947, when Partition took place. Noor Jehan who had in the meantime married the producer-director Shaukat Hussain Rizvi, left Bombay for Lahore. Rizvi acquired one of the studios left behind by Hindu film producers and launched Shahnoor Studios. The very first production Chann Wey in Punjabi (1950) was a runaway success both in East and West Punjab. It had popular numbers like Tere mukhre te kala til wey and Chan diya toteya oye dilan deya khotya. This was followed by another box office hit Dupatta. By the mid 1950s unfortunately, the exchange of films between the two countries was stopped. Noor Jehan’s fans in India would now listen to her enchanting melodies on Radio Ceylon. She appeared in many films produced in Pakistan, and later became a full time playback singer. She continued to be the reigning queen of Pakistan film and music industry until her retirement in early 1990s due to her failing health. Lata Mangeshkar, the Indian melody queen, always admired and respected Noor Jehan. It was in late 1951 that Lata Mangeshkar, on a visit to Amritsar, approached the local authorities to arrange her meeting with Noor Jehan at the Wagah border. My friend Padam Rosha who was then posted as the S.P. there provided all facilities and organised their meeting at No Man’s Land where they spent a few hours together. On a personal note I have been an ardent fan of the Malika-e-Tarannum for as long as I can remember. I had the privilege of meeting her in 1978 during her visit to Chicago where I was then the Indian Consul General. There was no Pakistani mission there at that time and the organisers of her concert asked Noor Jehan if she would agree to my being invited as the chief guest. I learnt that she readily agreed to the suggestion when told that I was a great fan of hers and also a Lahoria by birth and up-bringing. The hall was overflowing. There was a roaring welcome and a standing ovation as the Malika-e-Tarannum made her appearance on the stage. There was a thundering applause as she began the programme with that eternal melody Awaz dey kahan hai. I requested her to sing one of my favourite songs Laga hai misar ka bazar dekho, and she smilingly responded with the remark that she was thrilled to find the Indian diplomat familiar with her latest film music. 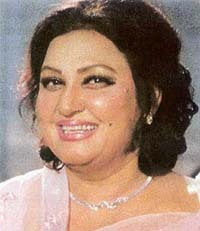 A great artiste, Noor Jehan belongs to the class of human beings who defy death. She is alive even today, as we listen to her haunting melodies.